When Michelle Zuccolo looks at a taxidermied animal, she sees something deeper than its bristly pelt or beady eyes. The Ballarat and Melbourne-based artist uses the stuffed creatures for models because it gives her an opportunity to help bring them back to life. “I’m a figurative artist and I like to base my images on observation,” she said. “I have a friend who does taxidermy and he lets me borrow them (the animals). That allows me to spend time work with them. She said while she tried to maintain a “level of humour” when drawing animals, she said the way humans used animals did tend to be something of a “gruesome practice”. She said her work wasn’t aimed at inspiring vegetarianism or veganism. “I think humane treatment of animals is important. We’re part of a circle of life but that doesn’t mean we have to abuse animals,” she said. Zuccolo completed her masters at Federation University and also taught there for five years. These days, she teaches art at the Abbotsford Convent in Melbourne, a thriving arts community. 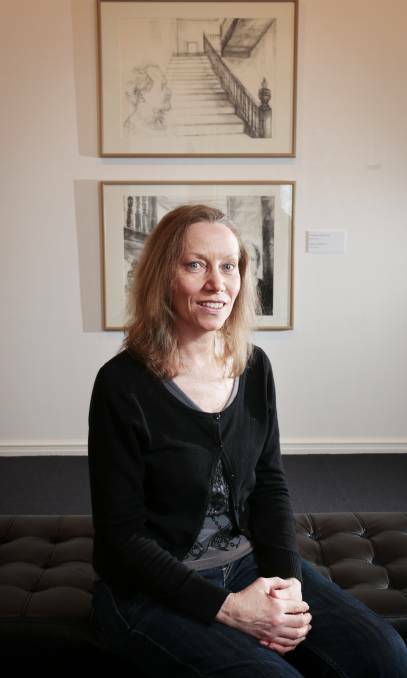 Her work is currently being showcased at Ballarat’s Post Office Gallery on Sturt Street, in an exhibition entitled From Flesh and Bone. The exhibition showcases her interest in natural form and the human psyche. Included is a series of portraits of nuns, which she completed in Australia following a fellowship in Italy and Austria. “I ended up working with three nuns – two in their 80s,” she said. “I was amazed because they are still so busy. I was quite in awe of these women who had these full careers of working in the community. They devote their lives to helping others and don’t want anything in return. The exhibition will continue at the Post Office Gallery until October 23.